Below I show this karmic law through an illustration. “Death” means separation. When our soul separates from our body we are dead physically. In a similar way we are separated from God spiritually. 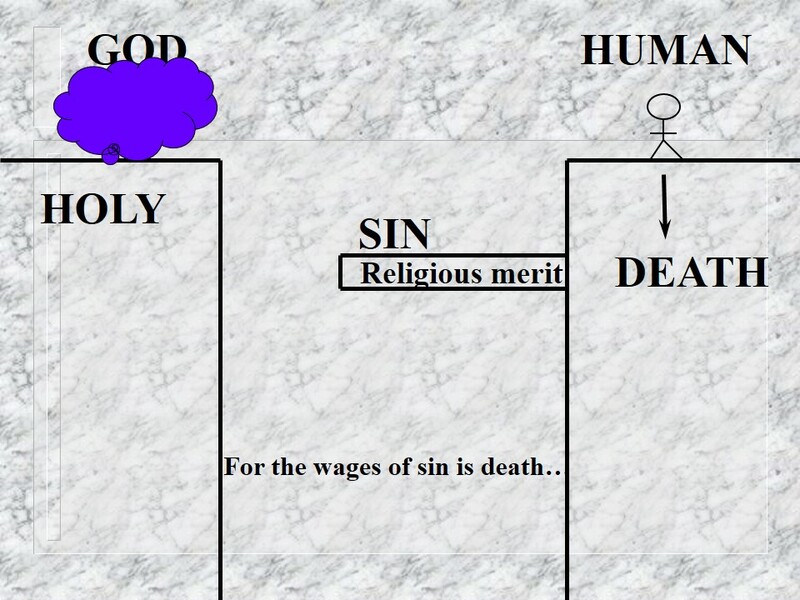 This is true because God is Holy (sinless). We can picture ourselves as being on a cliff and God on another cliff and we are separated by this bottomless chasm of sin. This separation causes guilt and fear. So what we naturally try to do is build a bridge that will take us from our side (of death) to God’s side. We offer sacrifices, perform pujas, practice asceticism, participate in festivals, go to temples, make many prayers and even try to reduce or stop our sins. This list of deeds to gain merit can be very long for some of us. The problem is that our efforts, merits, sacrifices and ascetic practices etc., though in themselves not bad, are insufficient because the payment required (the ‘wages’) for our sins is ‘death’. This is illustrated in the next figure. Through our religious efforts we try to build a ‘bridge’ to cross the divide separating ourselves from God. Though this is not bad, it will not solve our problem because it does not succeed in going completely over to the other side. Our efforts are not sufficient. It is like trying to heal cancer (which results in death) by eating veg only and by wearing bandages. Wearing bandages and eating veg is not bad – but it will not cure cancer. For that you need a totally different treatment. We can illustrate these efforts with a ‘bridge’ of religious merit that goes only part-way across the chasm – leaving us still separated from God. The Karmic law is Bad News – it is so bad we often do not even want to hear it and we often fill our lives with activities and things hoping this Law will go away – until the gravity of our situation sinks into our souls. But the Bible does not end with this Karmic Law. The small word ‘but’ shows that the direction of the Law is now about to go the other way, to Good News – Gospel. It is the Karmic Law reversed to one of Moksha and Enlightenment. So what is this Good News of Moksha?. The good news of the gospel is that the sacrifice of Jesus’ death is sufficient to bridge this separation between us and God. We know this because three days after his death Jesus rose bodily, coming alive again in a physical resurrection. Though some people today choose to disbelieve the resurrection of Jesus a very strong case can be made for it shown in this public lecture I did at a university (video link here). The Lord Jesus entered heaven and offered himself to God. In a sense, he performed a puja, accepted by God, by offering himself for cleansing of sin, on behalf of all people. Jesus is the Bridge that spans the chasm between God and man. His sacrifice pays our sins. Notice in this Moksha Principle how this sacrifice of Jesus is given to us. It is given as a … ‘gift’. Think about gifts. No matter what the gift is, if it is really a gift it is something that you do not work for and that you do not earn by merit. If you earned it the gift would no longer be a gift! In the same way you cannot merit or earn the sacrifice of Jesus. It is given to you as a gift. And what is the gift? It is ‘eternal life’. This means that the sin which brought you death is now cancelled. The sacrifice of Jesus is a bridge upon which you can cross to connect with God and receive life – that lasts forever. This gift is given by Jesus who, by rising from the dead, shows himself to be ‘lord’. 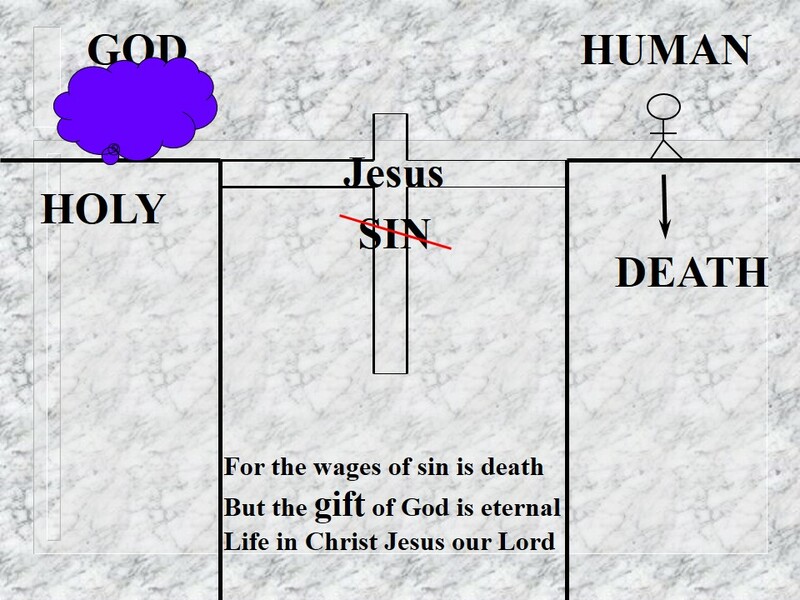 So how do you and I ‘cross’ on this bridge of life that Jesus gives to us as a gift? Again, think of gifts. If someone comes and gives you a gift it is something you do not work for. But to get any benefit from the gift you must ‘receive’ it. Anytime a gift is offered there are two alternatives. Either the gift is refused (“No thank you”) or it is received (“Thank you for your gift. I will take it”). So this gift that Jesus offers must be received. It cannot simply be ‘believed’, studied, or understood. This is illustrated in the next figure where we ‘walk’ on the Bridge by turning to God and receiving his gift he offers to us. Notice that this promise is for ‘everyone’. Since he rose from the dead Jesus is alive even now and he is ‘Lord’. So if you call on him he will hear and extend his gift of life to you. You need to call out to him and ask him – by having a conversation with him. Perhaps you have never done this. Here is a guide that can help you have this conversation and prayer with him. It is not a magic incantation. It is not the specific words that give power. It is the trust that we have in his ability and willingness to give us this gift. As we trust him he will hear us and respond. So feel free to follow this guide as you either speak out loud or in your spirit to Jesus and receive his gift. Dear Lord Jesus. I understand that with the sins in my life I am separated from God. Though I can try hard, no effort and sacrifice on my part will bridge this separation. But I understand that your death was a sacrifice to wash away all sins – even my sins. I believe that you rose from the dead after your sacrifice so I can know that your sacrifice was sufficient. I ask you to please cleanse me from my sins and bridge me to God so I can have eternal life. I do not want to live a life enslaved to sin so please free me from these sins that hold me in a grip of karma. Thank you, Lord Jesus, for doing all this for me and would you even now continue to guide me in my life so I can follow you as my Lord. This entry was posted in Common Questions, Our Need for Help and tagged how to receive Jesus, jesus puja, meaning of Jesus sacrifice, puja of jesus, receiving Jesus, the sacrifice of Jesus, what jesus has done on 02/11/2014 by [email protected].